Kit is well-known for her unique, dynamic and fast-paced training courses that produce clear results. She takes the time to know her audience before designing a customized training program that meets their unique needs and interests. Kit updates her materials continuously so that participants receive the latest information, tools and strategies that can be applied to their specific work settings immediately. As a leader in your organization, are you sometimes puzzled or even irritated by the “colorful” personality differences among your organization’s employees, your own team or even between you and your boss? If so, you are not alone. A variety of personality styles are just one kind of diversity in today’s work world but they can make or break your success. As we know, we all have our own personality style and that style directly impacts how we connect, communicate and collaborate with others. Often these working relationships go smoothly but they also can easily derail, with misunderstandings that seriously affect productivity. Using the the bright & bold colors of the Four Lenses Temperament assessment (based on Myers-Briggs theory & research) you will first identify your own unique personality style and then those of your colleagues. Building on that foundation, you will learn how each style prefers to communicate and what motivates them to be at their best. This understanding not only helps you in your professional relationships but gives you the tools to coach your supervisors and managers on how to work effectively with their diverse work forces. Join Katherine (Kit) Prendergast, certified Executive Leadership Development Coach, in this fast paced, dynamic course to learn how to identify and navigate these personality differences while bringing out the best of each of your employees. You will come away with a wealth of ideas, strategies and concrete tools to apply immediately to your own unique leadership role and responsibilities. Leaders who have developed strong social and emotional intelligence (SEI) skills are unique. These leaders know themselves well and are able to manage the power of their own emotions to benefit those in their sphere of influence.They have an innate sense of what is important to others and are committed to listening and responding to these needs to build strong relationships based on mutual trust. This is leadership success – the ability to inspire and motivate others to perform at their very best. You probably have seen these leaders in action. Others gravitate to them – it’s a joy to work with them. Research also shows these SEI savvy individuals move quickly up their own career ladders, make more money and are more satisfied because they have demonstrated that they can smoothly lead individuals, teams and entire departments to higher levels of efficiency. But how do they do it? 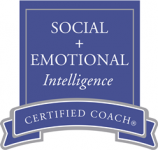 In this dynamic, interactive course you will learn what social & emotional intelligence (SEI) is and is not, the four core SEI competencies and how to implement these SEI skills in your daily leadership role. Real time work scenarios will be used to practice these skills with an emphasis on self-awareness, managing one’s own emotions, building strong empathic skills & the art of developing and sustaining relationships throughout your organization..
Come ready to relax, laugh and learn about yourself and how to become that leader that others truly want to work with and admire. It sounds easy, but recognizing one’s own strengths (and blind spots) first as an individual and then in your leadership role at work is often more complex and challenging than it first appears. It’s easy to get comfortable with how you have always managed and lead others, only to learn that when you step into a new leadership role with a higher level of responsibility the old ways may not work as well. This is the challenge for today’s emerging leaders. Our world of work is changing so fast that leaders at every level need to be extremely agile in meeting the needs of their teams, with the goal of maximizing engagement and ultimate productivity. But how does one learn to do this? Join other leaders in this hands-on interactive course to learn and practice these new skills. You will first take the Gallup StrengthsFinder assessment which will identify your top 5 themes of natural talent and how they contribute to the unique value you bring to your leadership role. Come ready to be pleasantly surprised at what you can offer when you are aware and willing to use your leadership strengths consistently to the benefit of others. Our world of work is rapidly changing, including the presence of five different generational age groups in the workplace. This is a real challenge for leaders who are now faced with very diverse needs and expectations of five different generations. And there is a sense of urgency . .. . our largest generation in the workplace has been the Baby Boomers but with the recent upsurge in our economy, they are retiring in greater numbers than ever before. This leaves behind a significant need for talented workers that can step in quickly to fill required skills and knowledge gaps. Sounds easy? It’s not. Our workplaces are increasingly multigenerational and despite everyone’s best intentions, generational problems occur frequently, including communication disconnects, disagreements on performance expectations and lack of team cooperation or collaboration. Leaders on all levels are tasked with solving these conflicts regularly. Learn how to tackle these differences with Katherine (Kit) Prendergast, certified Executive Leadership & Career Transition Coach, in this fast-paced, interactive course designed to help you bring out the best in your multi-generational workforce. Come ready to relax, learn and walk away with a wealth of ideas, strategies and concrete tools to apply immediately to your own unique work setting. Leaders get things done – and they get things done by their ability to engage, inspire and move others into action. But it is a challenge for leaders at all levels. You may be the department director, the line supervisor, the manager, the business owner or have a seat in the C suite, but unless others trust and are willing to follow you, it will be very difficult to get things done that genuinely matter. To complicate things more, today’s leaders are tasked with leading a diverse workforce comprised of multiple generations, varied skill and education levels as well as a range of personality styles. Gone are the days when one management style worked for everyone. To get things done through others takes a customized approach that is fast but efficient. That’s where a coaching management style can make all the difference. In this unique course, you will learn what coaching is and is not, who is “coachable”, when coaching is appropriate, basic & advanced coaching skills, how to do individual & group coaching and finally how coaching powerfully engages and inspires others. You will have the opportunity to watch a live coaching demonstration and, with a buddy coach, practice powerful coaching conversations. You will be surprised that adopting a coach management style can actually make your job significantly easier – that is the icing on the cake! Career resiliency is essential in today’s highly competitive, changing workplace. Join Katherine (Kit) Prendergast, certified Executive Leadership Development Coach, to learn what career resiliency really is, why it is critical to your career success and how your resiliency can add significant value to your company’s bottom line. In this fast-paced dynamic training, you will learn and practice 7 simple ways to build your own resiliency skills each day. We will draw on the best of the brain-based positive psychology exercises and signature strength themes, add a dose of the power of optimism and finish with you taking away a realistic resiliency plan that with help you move smoothly through the complex and multiple changes in your career. It can happen so fast! And it has happened to all of us . . . someone or something triggers one member of the team to explode, saying something they instantly regret. The explosion completely disrupts the work flow and progression of the company’s project. Bosses and colleagues try to get past it, but, really, no one ever forgets. Sound familiar? If so, join Katherine (Kit) Prendergast, Executive Leadership Development Coach for a fast-moving presentation to learn what emotional hijacking is and how to avoid it in the workplace. Come ready to relax, laugh and learn how to never, ever be emotionally hijacked at work again. Your team and your organization will thank you! “When I first considered Applying Emotional Intelligence in the Workplace, I thought, ’emotion has no business being in the workplace.’ I quickly learned how wrong I was. I have been working on increasing my E.Q. since. You wouldn’t believe how many great days I’ve enjoyed since! Attitude for gratitude, no emotional hijacking, understanding behavior vs. skills, etc. Another extremely beneficial lesson I have been employing is recognizing and embracing multi-generational team members’ differences. It’s often that I refer to the exercise where we got up and went around the room citing what we considered as characteristics of other generations. I was an “x-er” that held a somewhat negative view of millennials. After learning their strengths, how they feel about ‘x-ers’, and their influences when maturing, I shed my negative prejudices. An equally rewarding lesson in Millennial Acquisition and Attrition has really helped me in the workforce. I took a GM position in December that required me to hire a team, train and rely upon them for daily business. I am given examples nearly daily of how I may have approached an opportunity poorly had I not taken your classes.